Finca San Jose de Rivas has two streams through the property and Rio Chimirol on one border with a large waterfall, numerous cascades and pools, a truly dramatic river section. Some fruit orchards are established, a small caretaker house, water source and electricity all established. The area leads up to the entrance of Chirripo National Park, making this setting ideal for eco tourism or a nature reserve theme residential development ... or a family estate preserve compound. There is extensive road, utility and landscape improvements to nine building sites ready to utilize. 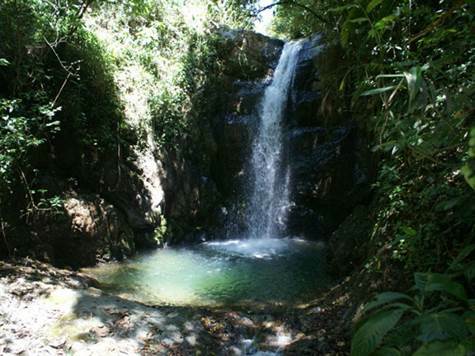 Many footpaths to discover the forest, access the waterfalls and swimming holes, simply walk and enjoy abundant nature. Only 30 minutes from the town of San Isidro, which is the main service center for the southern region, virtually all product, medical and general services are readily available or a day delivery away. A one and a half hour drive through beautiful country and you are at the beach, arriving at Costa Ballena, one of the most desirable coastlines in Costa Rica. Pods of Humpback Whales visit this coast two times a year, Ballena National Marine Park (Ballena is Whale in Spanish), world renowned surfing in Dominical and fine dining cuisine in the Village of Ojochal, are a part of what Costa Ballena has to offer . Finca San Jose de Rivas is also documented as a past center of indigenous activity, pottery shards and a remarkable stone with spiral carvings (photo included here) have been discovered throughout the land. A prominent rock landmark at one of the highest points in the property could have been the attraction for indigenous gatherings As you review the photos you will certainly acknowledge this parcel to be extremely unique. Contact me for a showing to truly experience the ambiance of this rushing river setting in a fresh mountain environ.